For screening multiple granular particle sizes. Trendelkamp classifiers make your continuous screening application easy. The proven linear oscillation causes the material to slide on the screen surface and thus prevents the individual particles from bouncing. The drive of the TK-K is frequency controlled and individually adjustable, thus adaptable to your application and saving energy. 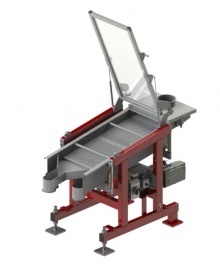 The separation screens– standard with holes 2 to 8 mm – are easy to change and easy to clean. All parts that are in contact with the product are made from stainless steel. For easy connections, all inlets and outlets are compatible with JACOB pipe system. The latest generation of TK-K classifiers have a new screening deck for improved screening performance and fulfill the needs for masterbatch applications. An automatic tapper unit frees off-spec pellets and debris stuck in the screening deck. The pneumatic tapper actuator can be individually adjusted via a cycle timer and is an optional item for the pellet classifier. The tapper impulse smoothly frees blocked holes in the screening deck and permits pellets to continue their movement. Are you interested in testing our classifier? Please contact us, we have trial systems on stock that fit your application. Let the TK-K speak for itself. The Trendelkamp TK-K pellet classifier was developed in direct response to customer requirements. Our virtually maintenance free construction allows for efficient and reliable classification of grain sizes. The systems can be designed for separating overs/goods or overs/fines/goods. SRV screeners are separating oversized pellets in one stage and are a cost effective alternative to the TK-K-systems for lower throughput ranges. The SRV has a compact design and is equipped with an AC speed drive for variable speed control.